With the coming of the new year, I am looking forward to many exciting opportunities and taking the blog to new places! There are also many intents I have for myself that relate to my day to day life, whether that be at home, in my career or in health. This post by fellow Toronto blogger Cassie Drake, An Architect Abroad, is a definite read! It really shows that we should be focusing on the whole process of achieving our newfound intents and how goal setting is sort of... well, short-sighted and leads to short-term results. If you're in the process of goal mapping this year, you need to get over there to check it out. Totally gave me a new perspective on the whole new year's resolution idea! I know that with all the exciting opportunities there will definitely be challenges and struggles along the way, as per every year! This year I am focusing on a new mantra. The bracelet I am wearing in this post was given to me by my mother for Christmas and I have barely taken it off since! It states "she believed she could, so she did". I absolutely love this quote! Every time I look down and see it I am constantly reminded that I am strong, powerful and capable of anything! Talk about inspirational, right?? Even though it's just a bracelet, having the words out there, on my wrist, is a powerful thing. I can look down and really reflect on the words, opposed to just hearing them in my head. After I received the bracelet I discovered MantraBand and their whole collection of inspirational pieces. There is really a special quote for everyone! The rest of the outfit may be simple, but it sure is bold. I am loving statement pieces lately and these Le Spec sunnies are my newest addition. First of all, can we talk about affordability?! I got them at Nordstrom and compared to similar styles they are such a steal. Gold, leopard and mirrored-- I love that they are fun, classic and totally retro. 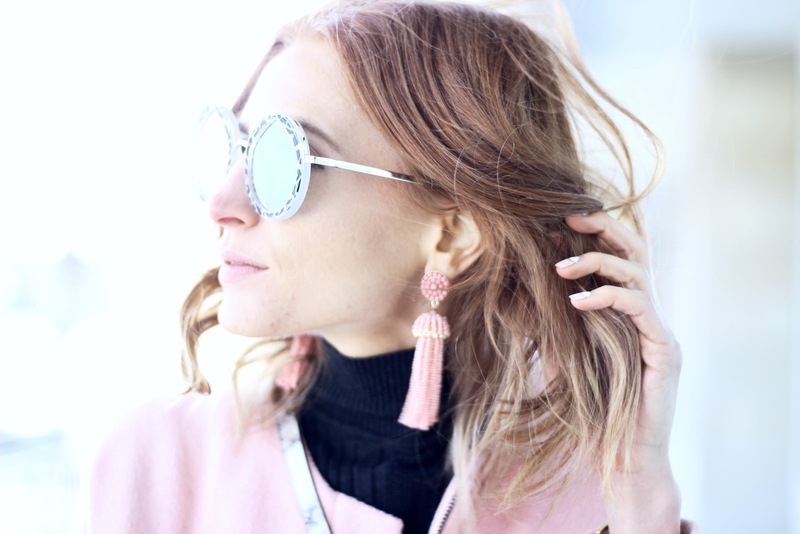 I also had been wanting to find some statement earrings and these pink bead tassels were the perfect pieces to pair with my (old, but classic) pink coat! The colours are a perfect match! 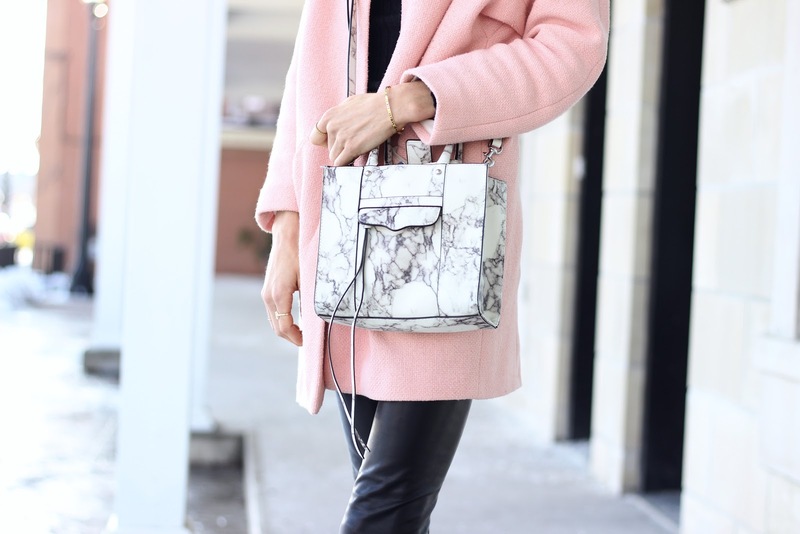 The marble bag, which seems to make an appearance every winter, was truly a statement investment that I made a few years ago, but it's one that I get the most compliments on and offers to buy! It's become a timeless piece that I can't part with. I know it's sold out but I've linked some similar marble bags for you below. What do you think of pairing all the bold accessories together? It's safe to say I am ready for a bold and bright year! How about you? Totally makes more sense when you look at it as intentions.. Same to you, Eleni! love this outfit, that coat and your sunnies are gorgeous! I love dressing up simple outfits with bold accessories :) I have stopped having resolutions a couple of years ago. I just kind of think about everything i did the previous year and then think about what I can do to better myself in the new year and what I would need to do to achieve them. That's exactly what it's about! It should all be personal. It's going to be a great year! So glad my post resonated with you, and inspired you to re-think resolutions. There are so many to choose from! Thanks for the inspo, Cassie! Great mantra! Loving all the details in this look. Such cool sunnies, earrings, print on your bag, and edge with your leather. Aw thank you Melissa! Same goes for you! This is our year! Love your look! Those earrrings bring it all together so perfectly! I can't wait to see where it takes you! Thanks, Kelsey! The sunnies are so rad! You look lovely! That pink coat is so pretty!